The humble acoustic guitar, in various iterations, has been around for several hundred years – even longer, when you consider Renaissance instruments like the lute. The modern American acoustic guitar was conceived by C.F. Martin back in 1833 – a design that continues successfully to this day. Although players have loved the classic and familiar tone produced by traditional dreadnaught or OM-style acoustic guitars, they have come to realize that these guitars are all-too-easily subject to the destructive effects of changes temperature and humidity. This is partly due to their design and the delicacy of their construction; cracked tops and warped necks are the most common. What about simple use/abuse? Pulled-up bridges, smashed backs, pierced sides…the list goes on. These are simply the results of regular use, live performances, careless roadies and/or the plain bad luck of the road. However, improvements have been made in the design and construction of acoustic guitars – mainly since the 1960s. DeMars Guitars, designed and built in the USA, have adopted the best of current guitar design – and added a few new innovations. These guitars employ chambered solid bodies of basswood with an opaque black finish (optional mahogany with a clear finish) joined to traditional tops made of AAA-grade Englemann spruce or AAAAA-grade flame maple. The tops give the instrument the appearance of a traditional acoustic guitar while the bodies avoid the structural disadvantages of traditional acoustic construction, including the delicacy and sensitivity to changes in temperature and humidity that often result in warped or cracked tops. How can the tops on traditional acoustic guitars vibrate freely if they are subjected to hundreds of pounds of pressure applied by strings pulling upward on the bridge? The vibrations of the strings on DeMars Guitars are captured by the under-saddle piezo elements without regard to a vibrating top, with only downward pressure onto the bridge saddle. There are no bridge pins, as the strings are retained by ferrules in the rear of the body. In addition to capturing string vibration at the bridge, the unique DeMars design captures the effect of the neck on the instrument’s tone. For decades, luthiers have recognized the importance of the neck to the instrument’s overall tone, but few, if any, have actually captured such. 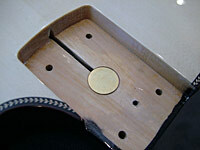 All DeMars Guitars feature a second dime-sized piezo transducer located at the neck heel. Both neck and bridge transducers are controlled via a custom onboard 2-channel preamp, facilitating the player’s control of pickup balance and EQ. The combination of superb quality woods, handcrafted construction, and unique electronics incorporated within the DeMars design concept results in an instrument that is infinitely playable and sturdy enough for life on the road or in the basement rehearsal space. While the “unplugged” acoustic tone of DeMars Guitar will never equal that of a vintage Martin or other high-end acoustic instrument, the strength of DeMars Guitars is apparent when plugged in and amplified. These are true PERFORMANCE instruments, designed and built for live use – from the local coffee house to a 20,000 seat arena and anywhere in between. Regarding cosmesis and ergonomics, the overall gestalt of the DeMars instruments are influenced by the pre-eminent industrial designers of the 20th and 21st centuries: Charles & Ray Eames, Jony Ive, Ned Steinberger, Hartmut Esslinger and Dieter Rams. All of these brilliant gentlemen imbued a “simpler is better” philosophy into their products. The bodies on DeMars Guitars are intentionally small, for several reasons. First, comfort. Many players feel that a traditional acoustic guitar is somewhat uncomfortable to wear while performing live. The body is too wide, the back digs into the ribs and the top edge digs into the strumming arm. DeMars Guitars are just 14” wide and 2” thick, similar to most electric guitars, with a comfortable rib-contour in the back of the body. Second is the instrument’s visual presentation; Dan says, “I’ve always liked the look of smaller guitar bodies with narrow waists: OM- and Grand Auditorium style acoustics, Les Pauls, the Music Man Axis (formerly the Edward Van Halen model), Rick Turner’s Model 1.” Third, since this is a chambered solid-body acoustic/electric instrument, the body size and the volume of air within the instrument don’t matter, nor do the shapes of the soundholes. 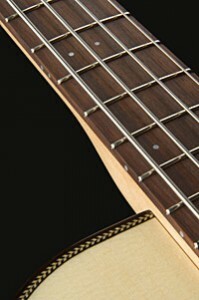 The round soundhole on the Viridis Guitar provides a “traditional” onstage look, while the F-clef shaped soundhole on the Long Trail Bass tells audiences, “I am a bassist!” Fourth is the use of gold hardware as standard equipment, which conveys a high-end appearance and visually compliments both the natural woods and the instrument’s black accents. The distinctive headstocks feature two attractive holes that produce a clean – almost art deco – design. Again, the influence of minimalistic industrial design is evident. The 13-degree angled headstock ensures even pressure over the nut. The Viridis & Equinox guitars features the Earvana compensated nut, which allows for near-perfect intonation along the entire fingerboard. The Viridis guitar and the 4-string Long Trail bass also employ the Earvana Compensated Acoustic Saddle. The 3-piece rock maple necks on all DeMars Guitars instruments utilize true bolt-on design; four precision milled aircraft-grade black oxide hex-head bolts are introduced into threaded brass inserts inlaid and epoxied onto the neck heel rather than crudely screwed into bare wood like on most “bolt-on” necks. The scale lengths for the DeMars instruments are a traditional and comfortable 25.5” for the guitars and 34” & 35” for the 4- and 5-string basses, respectively. At the 2008 NAMM Show, the DG line “went electric” as the Equinox line of electric guitars and Long Trail Mag basses were launched. Sporting the same dimensions as their piezo-equipped acoustic/electric counterparts, these new magnetic pickup instruments added an entirely new sonic palette to our line. On the guitar side, the Equinox H (dual humbucker) and Equinox S (three single-coils) were the first instruments introduced, followed by the Equinox B (Bigsby tailpiece and TV Jones pickups) and the Equinox T (Tele-inspired). We will soon be unveiling the Equinox Baritone (28.6″ scale with three lipstick pickups), the Equinox 12-string and the Equinox R (Bigsby tailpiece with three “toaster” style pickups). The Long Trail Mag basses (4- and 5-string) sport magnetic pickups by EMG, Bartolini or Basslines. All mag-pickup DG instruments allow for the addition of piezo-loaded bridges and an onboard Acousti-Phonic preamp by GraphTech, producing acoustic timbres to complement the electric pickups.